(Trent Nelson | The Salt Lake Tribune) Brigham Young Cougars running back KJ Hall (24) dives for yardage as BYU hosts the University of Massachusetts, NCAA football in Provo, Saturday November 18, 2017. Foxborough, Mass. • The BYU Cougars couldn’t help themselves on a cold, windy afternoon 2,100 miles away from Provo. They had to throw panic into the hearts of their fans, including a couple thousand who braved the elements at Gillette Stadium on Saturday. The Cougars spotted UMass 10 quick points, and it was beginning to look like 2017 all over again, when the Minutemen sneaked in to LaVell Edwards Stadium and handed BYU arguably its most embarrassing loss of the past half-century. But BYU righted itself after that disastrous start, scored 35 unanswered points, and took a 35-16 win in front of an announced crowd of 14,082 — the second-smallest crowd the Cougars have played in front of as an independent — to get some revenge for last year. More importantly, the Cougars (5-5) took a step closer to becoming bowl eligible heading into next week’s home game against New Mexico State and the regular-season finale on Nov. 24 at Utah. After fumbling away the ball the first time he touched it in an exchange with Aleva Hifo, freshman quarterback Zach Wilson led BYU to the win in his fourth career start. Wilson completed 14 of 22 passes for 167 yards and two touchdowns — both to Talon Shumway — and ran for a career-high 53 yards. That latter effort was part of BYU’s 221 rushing yards, including 154 in the second half, as Matt Hadley picked up 69 yards and a score and Riley Burt and Squally Canada added 31 apiece before Canada left the game with an undisclosed injury. That path on offense apparently includes a lot of run-pass option, which is why coaches turned to freshman Jaren Hall, rather than senior Tanner Mangum, for mop-up duty on BYU’s final possession. Hall became the first African-American to take regular snaps at quarterback in BYU history, and guided the Cougars into scoring territory before taking a knee a couple times to end the game. BYU’s defense got gouged early, as UMass took the opening kickoff and marched 71 yards to the BYU 4, thanks in part to a face mask penalty that kept the drive alive. Cooper Garcia’s 20-yard field goal gave UMass a 3-0 lead, and after the botched handoff, the Minutemen scored again on Marquis Young’s 2-yard plunge to take a 10-0 lead. After that, it was all BYU. UMass picked up just 183 yards the rest of the game and were stopped cold on their next four possessions. The Cougars drove for touchdowns on three of their first five possessions of the second half to put it away. Hadley had a 2-yard touchdown run after Neil Pau’u made a fantastic catch on a flea-flicker, then Aleva Hifo scored on 3- and 10-yard touchdown runs. The Hifo touchdown that put BYU ahead 35-10 came after a UMass punt into a fierce wind netted zero yards. Senior linebacker Rhett Sandlin recorded two sacks, another tackle for loss, and scooped up the punt and was headed to the end zone but the play was called dead. • The Cougars improve to 7-4 in NFL stadiums over the past 10 seasons with a come-from-behind win over UMass at Gillette Stadium, home of the New England Patriots. • Zach Wilson throws for 167 yards and runs for 53, a career-best, in his fourth start. 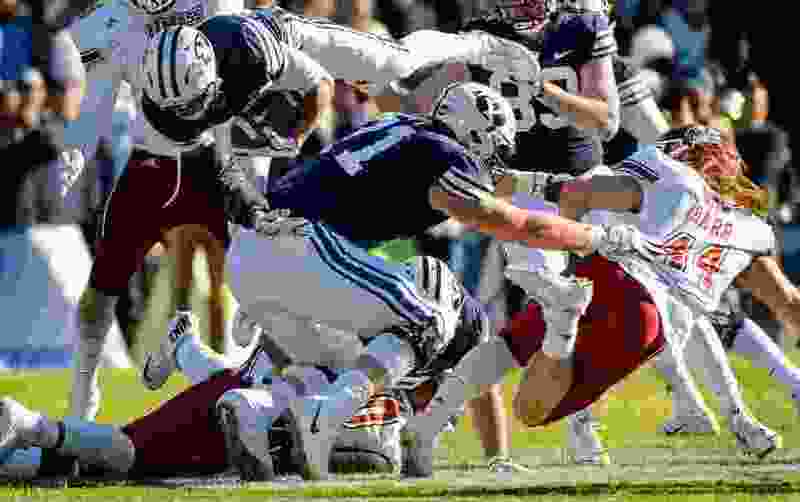 • BYU’s defense holds UMass to season lows in total yards (285), passing yards (183) and yards per play (4.13) in avenging last year’s 16-10 loss in Provo.